The Wiggles - Splish Splash Big Red Boat and it's time to wake up Jeff! 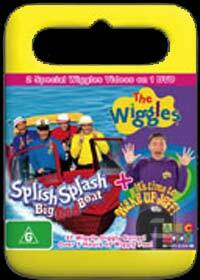 Splish Splash: Take a ride with The Wiggles on the Big Red Boat in this awesome ocean adventure, featuring 19 Wiggly Giggly songs like Big Red Boat,Captain Feathersword Fell Asleep On His Pirate Ship, Ponies and Wiggly Party. Travel to Wigglehouse for a picnic with Wags the Dog. Join Captain Feathersword on a Sydney Seaside Swim and learn Spanish with the animated Mariachi Wiggles. So come aboard and get ready to make waves of rippling good fun! Wake Up: It's time for wiggling, giggling, moving and grooving around the clock as The Wiggles sing and dance to keep their sleepy friend Jeff awake long enough to join the show! Featuring 18 songs like Wake Up Jeff!, Romp Bomp A Stomp, I Can Do So Many Things and Guess What?. Children will love dancing and singing with Greg, Murray, Anthony and of course, waking up Jeff! 2 Wiggles DVD's on one? Roadshow have once again done it again that gives children 180 minutes of those original pranksters, the Wiggles. Join the four wiggles and they take children on a magical tour of entertainment, learning and peace and quiet for the parents. Presented in an aspect ratio of 16:9 widescreen with Dolby Digital 2.0 stereo with a plethora of extras! 4 Bonus Episodes of Lights, Camera, Action, Wiggles!